By this point in our travels we’ve seen a lot of the fall out thanks to the rapidly shifting landscape that enveloped black popular music in the late 1940’s and how artists who hadn’t quite established themselves in one genre suddenly had to confront the growing monolith that was rock ‘n’ roll. The question for all of them still trying to carve out a spot in music beyond just whatever club dates or session work they could scrape up essentially boiled down to this: Do you give yourself over to this new music that was becoming more popular by the minute, or do you stick with longer lasting idioms which carried more artistic weight but which were tough to break through in even when that was a far more dominant sound than it was by 1949. At this stage with Billboard charts featuring ever more rockers filling up the Top 15 spots (and more blues records for that matter taking up space as well) all coming at the expense of the classier opportunities of jazz, pop and big bands that had ruled for so long the answer to the question seemed painfully obvious to all but the most pig-headed of artists and record labels. If you wanted to keep putting Professional Musician as your occupation on your tax returns you had better go where the money was, which in 1948 and ’49 meant rock ‘n’ roll. 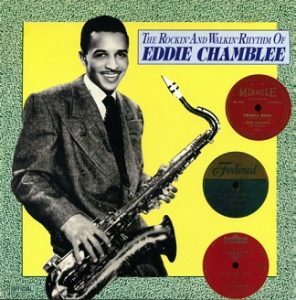 Eddie Chamblee of course was one of the many who had done just that, by chance as it were way back at the tail end of 1947 when he was enlisted to lend his horn to a studio session band and wound up being the featured centerpiece on two #1 hits in the year that followed. But while that should have ensured he’d be set for life… or at least for a couple of years, able to live off the notoriety of those hits to secure live gigs and as many opportunities to record for whatever label’s doorstep he landed on, Chamblee had a bit of a dilemma. 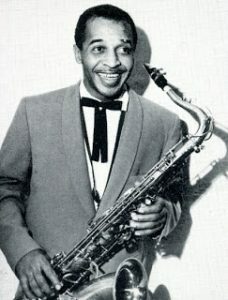 For starters he and Sonny Thompson, the bandleader of that session group whose name both Long Gone and its follow-up Late Freight had come out under and whose piano, writing and arranging skills played such a vital role in their success, were no longer recording together. Their temporary pairing on those sides was merely happenstance, not a permanent condition and so both men were now back on their own, yet still in a position requiring they capitalize on the good fortune they achieved together. That might’ve been the least of his concerns though because Chamblee was now also faced with the same vexing problem that other unwitting – or unwilling – sax men who stumbled into a revolution none of them saw coming had been wrestling with once the smoke cleared, namely that a lot of these guys were conflicted over what to do next. Now that he was on his own he had to decide whether to keep doing what worked, aiming for the increasingly opportunistic rewards that were awaiting the best rock musicians if they gave into their primal musical instincts and cut loose. Or do you pull back, hoping that the popularity from hitting those heights once or twice by accident in a field you didn’t necessarily feel comfortable in would be enough to draw interest to your more modest efforts in a less outrageous style of music? For most of these conflicted souls it seemed that they were attempting to split the difference, sticking with rock releases but holding back somewhat so as not to offend humanity in the process. Needless to say it didn’t really work. So as 1949 rolled around saxophonists were left asking themselves what mattered most to them? Was it merely to find tangible success? Or were accolades and respectability more enticing for artists who viewed their work AS art rather than as simply commerce? Those outcomes were too often seen by the musicians themselves as being mutually exclusive propositions. Coming of age in an era where nobody, even the biggest stars of black music, ever get their just due, financially or even in terms of universal praise, they contented themselves with gaining the respect of other musicians. But as time went on and the commercial prospects were becoming more spread out as cruder forms of music found a large previously untapped audience waiting, the artistic quality in aiming for that constituency would have to suffer. For Eddie Chamblee the stakes perhaps were a little different. Though he’d arguably had MORE success than any of the other horn blowers who collectively dominated 1948, he had been only one component of that success, not even the featured artist – pianist Thompson was – and so unlike a Hal Singer perhaps who had landed at the top of the charts under his own name with a record he didn’t particularly feel proud of cutting (Cornbread), Chamblee may have been more free to follow his own muse since he wouldn’t necessarily be turning his back on a fervent audience who was anxiously awaiting HIS next move specifically. It also may have helped that unlike Singer and most of the other horn hot-shots to date, Chamblee had risen to prominence playing a slightly less brazen style to begin with, cutting insistent grooves without ever pulling out all of the show-stopping techniques that were fast becoming the norm in rock. You might call it a comparatively laid back approach… a mellow riff based variety of rock… or if you wanted to be clever and try the patience of your readers of this review you might even call it somewhat of a Lazy Mood and leave it at that. Right away you can tell that this was not the side they were putting their money on to make hay with the rock crowd. Lazy Mood was either an attempt at expanding his prospects by appealing to a slightly different audience or an exercise in musical indulgence designed to keep Chamblee interested in his work rather than feeling compelled to cut only what the company felt would sell best. But that doesn’t mean Lazy Mood is without merit, even in the rock field where its inclusion is slightly, but not entirely, ill-fitting. In fact while the record is decidedly less commercial than Back Street, it definitely shows more actual creativity than the hit top side and as such it gives the band more chance to leave their own mark on the arrangement. The recording information for this is rather spotty but we do know it wasn’t cut at the same session as the aforementioned Back Street and as such it features a different supporting crew. Some sources suggest blues pianist Roosevelt Sykes was on hand while others say it was The Sharps And The Flats with whom we’re well acquainted seeing as how it was that outfit which was laying down the rock solid support on the work Chamblee did with Sonny Thompson which gave them their hits a year ago. It’s a shame we don’t know for sure because they really need to be given some credit for making this work as well as it does. Though Chamblee naturally remains the centerpiece of the song, blowing a fairly pleasant riff, only occasionally straining to convey a bit more urgency, the others match him in mood as they subtly add shadings to the overall picture. The drums lay down a steady modest beat, light but perfectly suited for the atmosphere before the bass takes over, moving to the forefront. If not Leroy Morrison of The Sharps And The Flats then it’s likely Andrew Harris who is plucking the strings and since the standup bass – especially at this point in rock’s evolution – was rarely put up front in songs this gives us a good chance to examine its stately warm sound that increasingly became less suited to rock the more raucous the music became over the years. Here it plays a nice steady trance-like pattern which works well against Chamblee’s horn. Meanwhile the guitarist, either Arvin Garrett or an anonymous accompanist who was on the session this track emerged from when playing behind St. Louis Jimmy Oden earlier in the day, contributes some very discreet interjections, his hollow ringing tone sounding distantly alluring in the mist. Though Chamblee never takes the song out of first gear giving the impression of either an early evening warm up at a supper club or a very late night at the same club after the joint has mostly cleared out, the song is well put together with not a hair out of place. BUT…. yeah, by now you surely know there’s always a “but” when it comes to songs like this. As I was saying… But the rock landscape this gets dropped into is hardly the place for sleepy records with modest goals. The context required for this to work are far too quirky and as a result it’s unlikely to ever be heard in the appropriate setting with a receptive audience who came in search of something else entirely. Rock ‘n’ roll was a record oriented singles market in 1949, dominated by jukebox play, some house parties or the rowdier club scene. In those circumstances Lazy Mood quite simply wouldn’t connect at all. It’s too restrained, too lightweight, too classy for its surroundings. A record like this wouldn’t be heard over the din of the crowd and in a live venue that was hosting nothing but impatient rock fans itching to lose their inhibitions this would send them scurrying for the exits in search of a wilder scene around the corner at some other place where the musicians might be of a collectively poorer quality, but as long as they aimed low and hit you below the belt with the appropriate lewd and lascivious sounds it would hardly matter. It’s not that rock is required to put the pedal to the metal, cranking up the volume and keeping the beat relentless at all times, but when it does slow things down it needs to do so in a way that fits in with the more typically manic sides. We’ve seen how this works best plenty of times to date, recently with songs like The Orioles Tell Me So or further back with Amos Milburn’s Bewildered, huge hits which were slow and rhythmically restrained but which cranked up the emotional content in the singers deliveries, thereby giving the audience a deeper connection to the sentiments as they took a breather from the dance floor. Because this is an instrumental Chamblee and company can’t do the same here and so it’s left to the melody to try and burrow its way under your skin and keep you grooving without breaking the hypnotic spell. The problem is Lazy Mood HAS no hypnotic spell to speak of, it’s a much more transient melody, one that is nice and pleasant as it plays but completely unmemorable once it stops. Even after listening to it a half dozen times in the writing of this review it failed to make much of a lasting impression. Once the track ended and I began looking back over the recent entries to see what ballads would make for a good contrast my mind instinctively picked up on those songs and I forgot everything about Lazy Mood other than the title and the overall feeling that it was something best heard in passing. Returning it to so as to refresh my memory of how it sounded might’ve made it seem slightly better than that rather harsh critique but not so much better that I could ever recommend it with any conviction. All of this context is important to consider because that’s how listeners of the day would’ve heard it and would quickly either embrace it or dismiss it based on those initial reactions. A song such as this might work far better over the radio where it could be supported by the surrounding records, skillfully chosen by a trusted disc jockey who manipulated the entire flow of the program by each record they played, all while setting an appropriate mood with their honeyed tones in the night. In THAT realm you might respond far better to the unpretentious charms of Lazy Mood, but there weren’t many outlets for that type of presentation in 1949 and so to connect with the audience it needed the record would have to slug it out in the sweaty environments rock thrived in and there it’d be quickly shoved aside, knocked down and trampled by a throngs looking for something more urgent and alive to make its mark. Oh well, B-sides are rarely what serve to keep an artist moving up in the world and likewise are not often the cause of their descent. Lazy Mood was nothing more than a picture of Chamblee taken from a different angle with a different lens and not one that would adorn a notice of his next show, at least not one billing itself as a rock ‘n’ roll dance. As such it’s not something we can recommend for our needs but it’s also not one we take much pleasure in criticizing either. It accomplishes musically what it set out to do which is showcase the skill of the musicians as they tackled more muted fare than they were otherwise being expected to provide. They do it well enough to admire from a distance I suppose, but the closer it comes to the flickering rock ‘n’ roll flame the more it wilts in the heat, making it a perfect song to lazily drift off to sleep to as twilight rolls around. 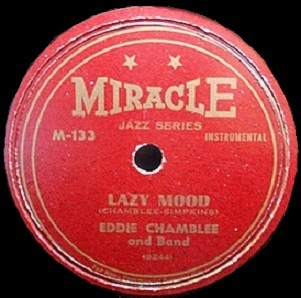 Leave a reply on "Eddie Chamblee: “Lazy Mood”"